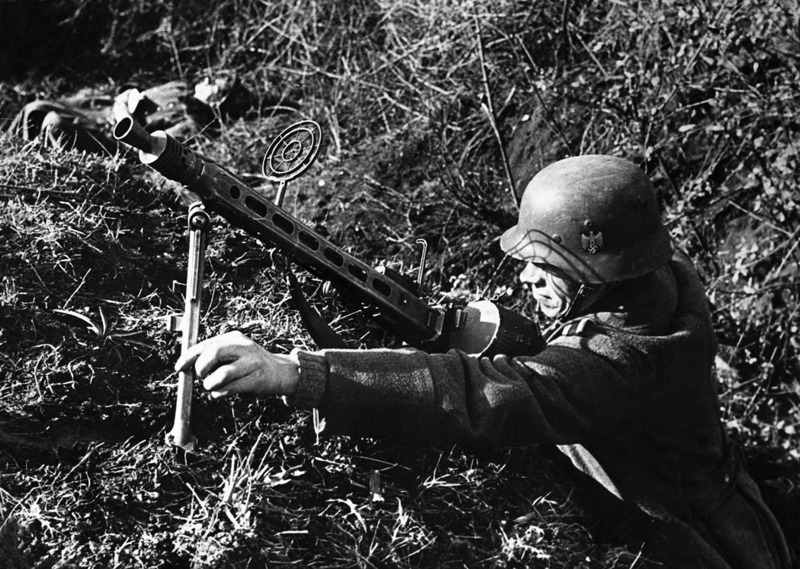 Without doubt one of the most far-sighted and influential machine guns created in World War II, the Maschinengewehr 42 was in terms of its design and manufacturing requirements a truly outstanding weapon that has exercised a long-lasting influence over later general-purpose machine guns. The Mauser-designed MG 42 began life as the MG 39/41, whose origins could be found in the MG 34 and some Polish thinking. Like the MG 34, the MG 34 could be installed on several alternative mountings, but so far as troops in the field were concerned the MG 42’s primary advantage over the MG 34 was its higher rate of fire. The locking system was novel but simple and reliable, the barrel-change system was quick and easy (as demanded by the high rate of fire), and the greatest innovation was the ease with which the weapon could be produced: the use of stampings and spot welding whereve possible to reduce cost and hasten production even when only semi-skilled labour was available. The MG 42 first saw service in North Africa during 1942, and from that time onward the weapon became one of Germany’s most important and feared tactical weapons. A final development was the MG 45 with a different mechanism and an even higher rate of fire, but this was only just entering service as the war ended.